Supplies for large printing equipment, in addition to drafting supplies, are stocked in our offices. Walk in and pick up supplies, email us or order by phone and have them delivered or shipped. We can order special sizes and media that are not in stock. 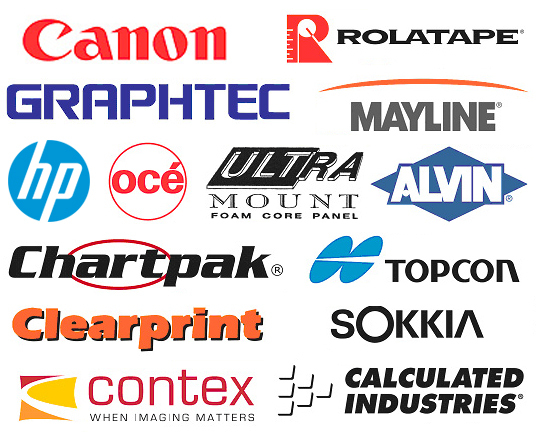 We stock Oce, Hewlett Packard, Kip and Canon toner and ink cartridges for large format equipment. If we don't stock it, we will try to find it for you. We strive to meet all the supply needs for our customers. In pursuit of this goal, A & B carries a wide variety of items from paper, toner and ink jet cartridges, to drafting supplies. We carry the major brands of drafting equipment suppliers including Alvin, Mayline, Pentel and Clearprint to name a few.